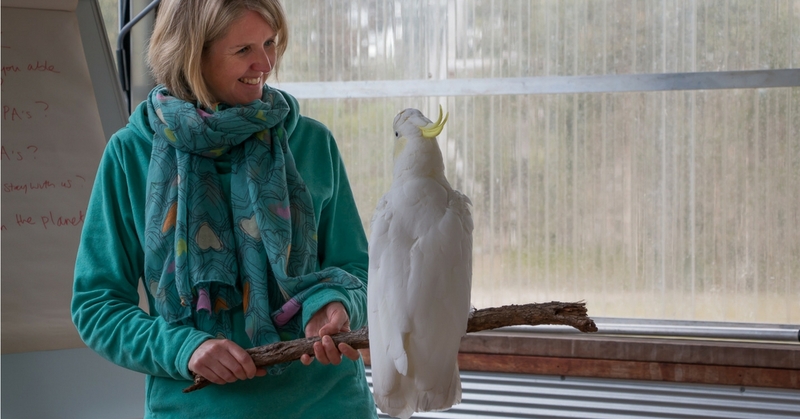 Join one of the world’s most loved and acclaimed animal communicator’s, Pea Horsley, on this one-of-a-kind retreat, where the focus is on ethical, respectful and meaningful connections with wild animals in their natural habitat. Canada will expand your world beyond your imagination – two top predators in one animal communication retreat experience. The world famous Blackney Pass for orcas and the wilderness of the Great Bear Rainforest for grizzly bears. Receive direct wisdom, energy and power from ancient mammals who have learned how to harness great strength alongside great gentleness and love. Expand your consciousness through deep communications, internal journey, meditations and spontaneous animal-initiated healing to regain and remember your inherent wholeness. Accelerate your own personal transformation through the guidance and energies of orcas and grizzly bears. You will leave with a relaxed body, a calm mind, a heart bursting with love and a rejuvenated spirit. All accommodation, internal flights, tours, Kayak equipment, group support and most meals are included in your retreat price, all you really need to take care of is your flight and transfer to Vancouver city. By midsummer Blackney Pass is sea mammal central! At this time of year orcas sometimes gather into a ‘super pod’ – one of the greatest wildlife spectacles on earth. Paddling amongst the orcas and humpback whales is an unforgettable experience comparable to the great wildebeest migration of Tanzania. The adventure begins with an awe inspiring boat ride through the wildlife rich waters of Johnstone Strait to our private safari-style camp. You have only to peek outside your tent for something to catch your eye – a soaring blue heron, a breaching whale, the fluke of a humpback. 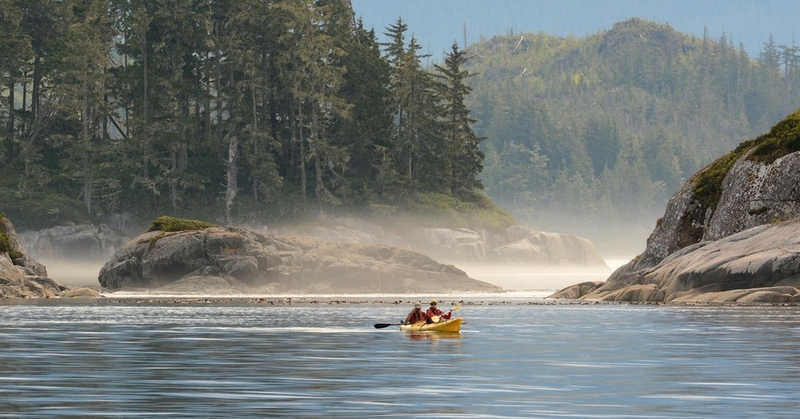 The Broughton Archipelago is one of the finest locations to kayak anywhere on earth. Our location is a beautiful beach on White Beach Pass of Compton Island, the home of the MamMamalilikula-Qwe’Qwa’Sot’Em First Nation. You may be blessed to have an orca swim beside you or even under your kayak. You may even experience humpback whales bubble-net feeding. When it comes to wildlife in this location everything is possible. Pacific white-sided dolphins, sea lions, seals and bald eagles – did I mention wildlife! A clawfoot bath tub with lots of hot water and a view! 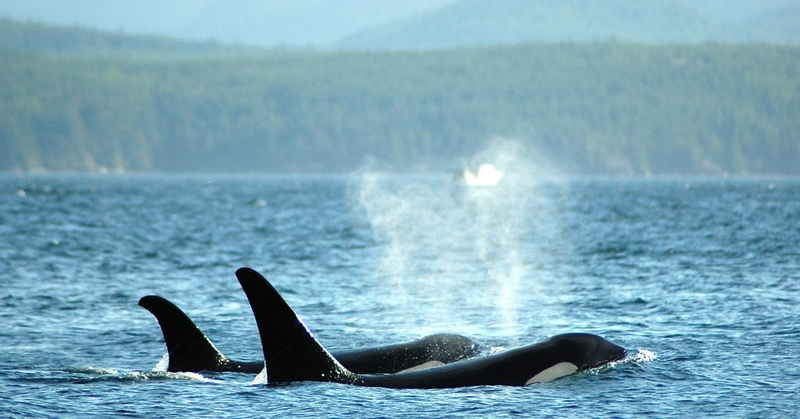 ”The island, located on the aptly named Blackfish Sound, is prime location for Orca and Humpback viewing. The kayaking was fun, and having the option to track Orca pods and Humpbacks from the boat allowed us to spend lots of time observing the animals. We were fortunate to observe Humpback bubble-netting and lunge feeding. This is a safari complete with a comfortable basecamp. 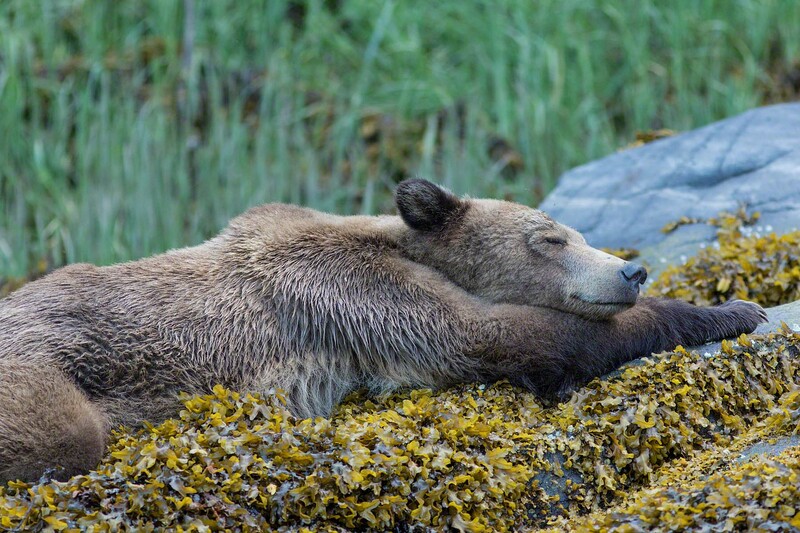 Your bear experience begins with a spectacular seaplane journey from Port Hardy to the Great Bear Rainforest, one of the best places in the world to observe grizzly bears. Conservationists consider this area to be a rare jewel in today’s world, one of the few complete and relatively intact ecosystems remaining on the planet. Tucked away in a stunning wilderness location your base Great Bear Lodge nestles against a backdrop of snow-capped peaks, forested hills and waterfalls. Enveloped in silence and tranquility, the only neighbours are the birds and mammals which inhabit the area. You’ll experience six excursions guided by a wildlife biologist and natural history educator, by boat down the shoreline or watching bears on foot just yards away as they fish for salmon. We’ll have the privilege of being on the traditional lands of the Gwa’sala-‘Nakwaxda’xw Nation where the BBC filmed ‘Magical Forest’ of the ‘Secrets of our Living Planet‘ series. Our hosts are rated by National Geographic Adventure as one of the Best Adventure Companies on Earth. ”"In the few short days of being here, I had captured some of the most special memories travelling so far." Here is a little taste of what you could experience! Receive Orca Medicine; move beyond perceptions of Orca preying on others and engage with their lessons of community, loyalty, longevity and the willingness to travel. Orcas can teach you lessons in communication, leadership and team work. Expand your consciousness by heart-led communications with the Guardian of the Ocean, named by Northwest Native nations. Orca is also a symbol of great good luck. Receive Bear Medicine; their hidden strength lies in their ability to travel between the physical and spiritual worlds. Learn the importance of personal hibernation from one of the world’s experts and come to understand that bears access their inner world when they find a safe and womblike environment. Bears can teach you how to travel into the dreamtime, where you can be rejuvenated by the source of all life. Learn the biggest lesson of the Wilderness; In a world where we are known by our work or by the image we project, it’s so easy to live out of a false identity, our true identity is often found in the wilderness. Harness the power of intention by aligning yourself with your heart, mother earth, nature, power animals, the elements, to manifest your heart’s desires. Open to your own innate communication super power and healing gifts so that you can heal animals and your own mind, body, spirit. Land in Vancouver International airport (YVR) and take the SkyTrain into the city alighting at the ‘Waterfront’ stop. Within a few minutes walk you’ll be at your harbourfront hotel enjoying a muscle soothing bath or warming spa to cleanse away the airmiles. Depending upon your arrival time and energy level, you’re invited to meet up for supper or a drink before a restful night’s sleep. If you’d rather do your own thing that’s ok too, there is plenty of time to get acquainted with fellow retreaters the following day. After a healthy breakfast we’ll take the SkyTrain to Vancouver’s Domestic airport to catch a Pacific Coastal plane to Port Hardy around 1pm. 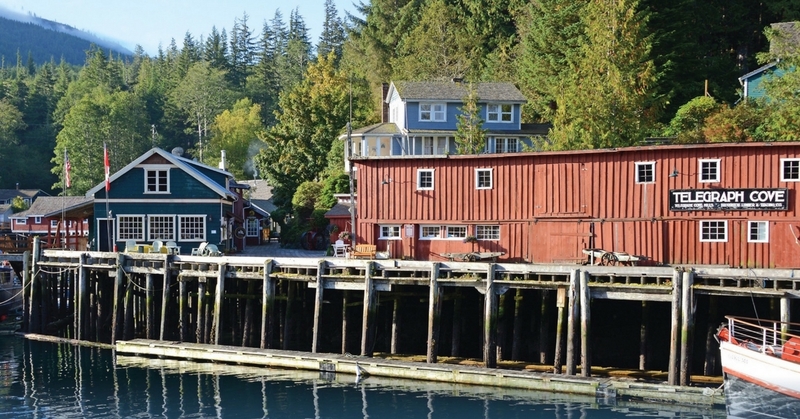 From here we’ll transfer down to Telegraph Cove and our rustic historic cabin. Explore the Whale Interpretive Centre which was created to provide information to the public for increased awareness of the biology, habitat needs and threats to killer whales, fin whales, humpback whales and sea otters as well as other local marine mammals, or if you prefer wander the waterfront for peace and quiet. There will also be a brief group gathering and a whale honouring meditation, followed by a casual supper in a local eatery as we soak in the ambience and shift down a few gears into the wilderness zone. We’ll be met by our Orca Kayak hosts at 11.30am. 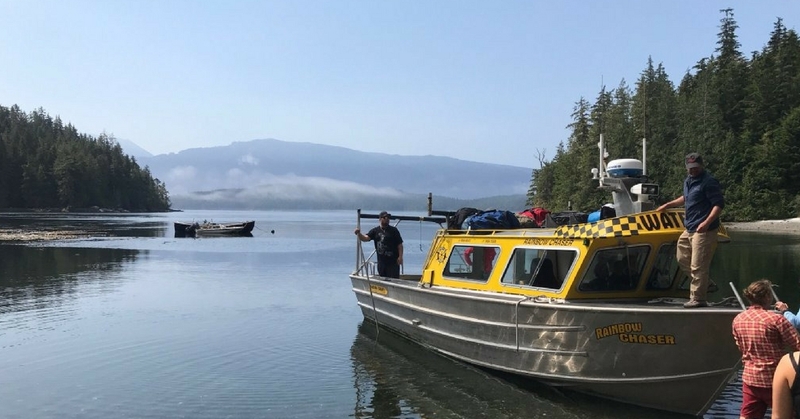 After a brief introduction we’ll gather our luggage and transfer on to our water taxi to begin the 1 hour journey through the wildlife rich waters of Johnstone Strait to camp. Encountering whales, dolphins, seal lions and other marine mammals is likely so be ready for communication with your camera handy. On arrival at camp we’ll enjoy our first lunch while going over a camp orientation and discuss the next days adventures. After the camp orientation you’ll be shown to your tent where you can settle in to your new home. A tea or coffee can be enjoyed on your deck while taking in the beautiful surroundings of camp. Our afternoon adventure could include a trip to watch the killer or humpback whales or exploration of the nearby Islands. The Broughton Archipelago Marine Park, snow capped mountain peaks, and stands of old growth forest provide a gorgeous setting for paddlers to witness the congregation of up two hundred resident and transient pods of Orcas. 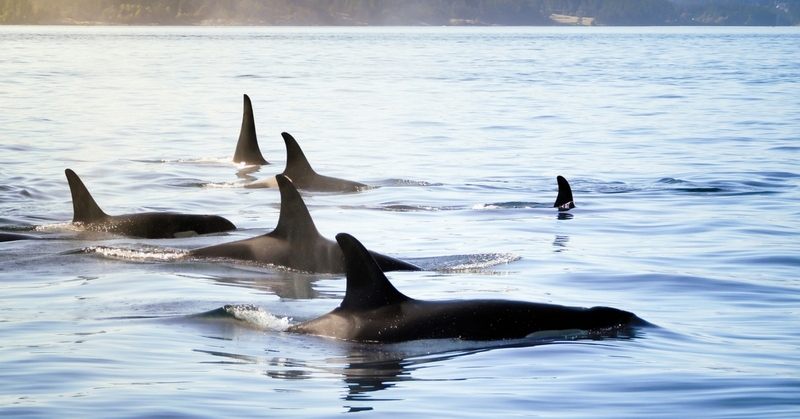 Vancouver Island is where J-Pod makes their home. This generations-old family of Killer Whales has been making a resurgence in numbers recently. Return for dinner and if weather permits, a fire on the beach. Your first night under canvas may be accented with the intermittent sounds of humpbacks breathing and if very lucky the howls of a grey wolf. 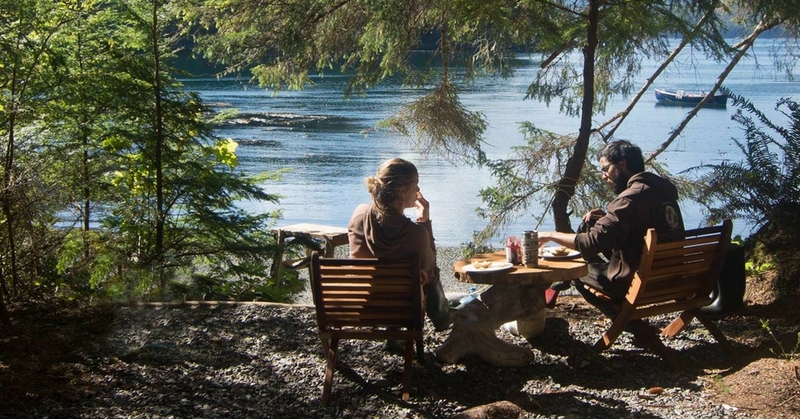 ”I travelled around BC for five months and this place was the most special. The camp was built with love and you can feel it. Gaze out towards the grey blue waters of the Pacific Ocean and watch for passing orcas, white-sided dolphins and sea lions. Listen to the silence as you revel in the natural wonders of the pristine and raw landscapes that surrounds you. Today will be dictated by the location of wildlife, weather, and our group desires. This might be a good time to explore the countless islands by sea kayak or search out for some nearby whale activity on our whale watching boat. Return after a day of adventure for dinner and gathering around the beach camp fire. ”PARADISE IN NATURE = LOVE. The tranquil surroundings are divine and the sound of the whales blowing were continuous. What a treat! Another blissful day to kayak out to the orcas or take the boat to reach them further afield. Look out for Northern Resident killer whales, transient killer whales, humpback whales, fin whales and harbour porpoises. You could also kayak alongside Steller sea lions, sea otters and Pacific white-sided dolphins. 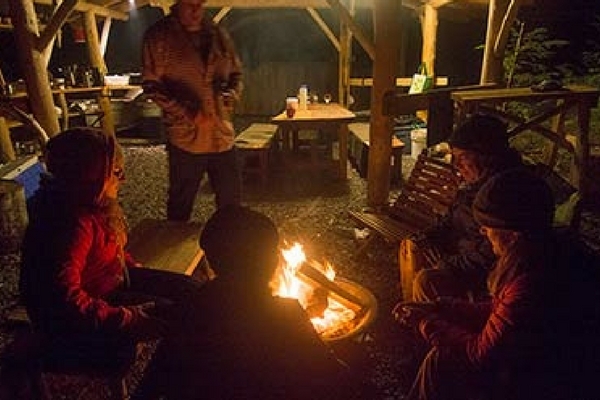 It’s also possible to visit ancient first nations village sites, or alternatively take some time to relax around camp. ”YOU HAVE TO GO THERE! I had the chance to stay at this beautiful place and it was just incredible – so many wonderful things! I saw whales so close I could almost touch them. This is our final experience on the water to say goodbye to our new whale friends. 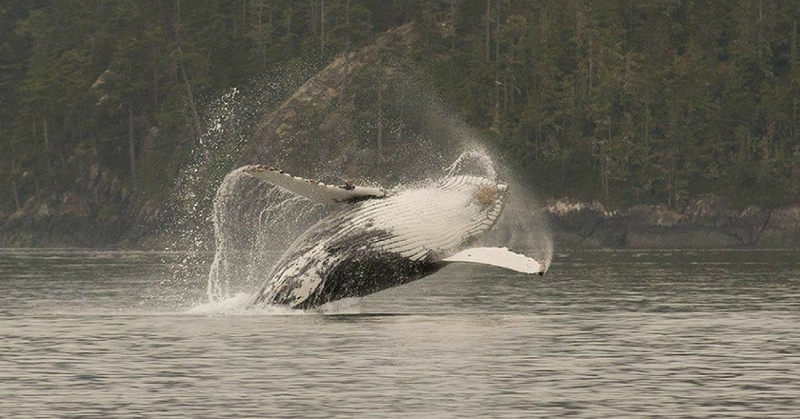 We may be blessed with a breaching humpback whale acknowledgment or an orca pod honouring. Afterwards we’ll return to Telegraph Cove by water taxi arriving around 1pm for lunch at the Killer Whale cafe. At 2pm we’ll transfer back up to Port Hardy for the next leg of our retreat. Here we’ll be met by our grizzly bear hosts for a seaplane flight to Great Bear Lodge. 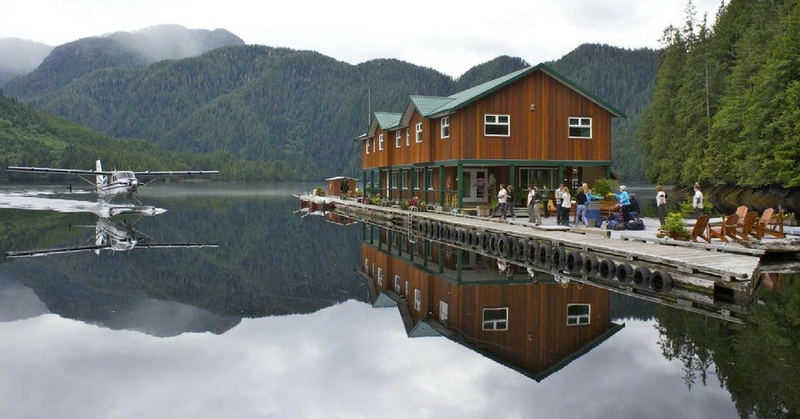 Flying to the lodge in the Great Bear Rainforest is a spectacular adventure in itself, travelling over the breathtaking scenery of the central coast and over the rich waters of Queen Charlotte Strait, the home of orca, grey and humpback whales. This coastal ecosystem revolves around the annual return of five species of Pacific salmon each autumn that provide a rich nutritional bounty, which allows for the immense trees and bears for which this coast is famous. 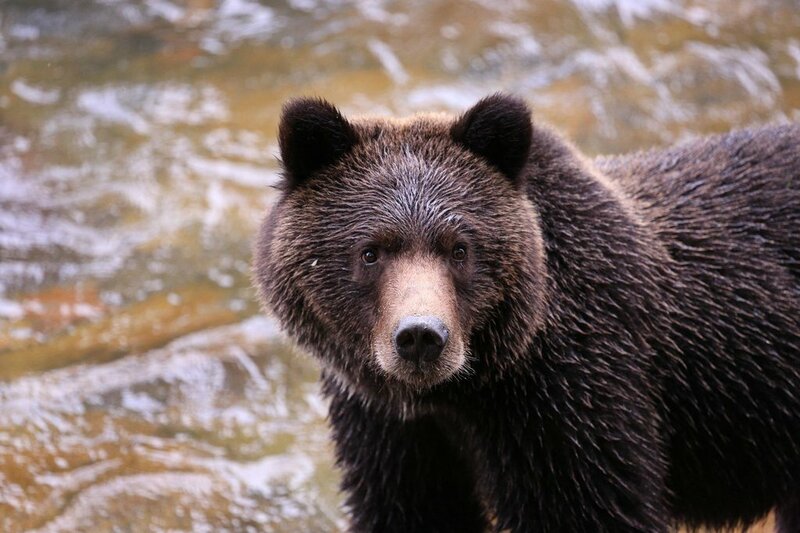 This is an unforgettable way to start your wild bear experience in Canada. Upon your arrival at the lodge, our hosts will be on the dock to welcome us to our wilderness retreat and to give a bear briefing. Settle into your private room at the lodge, before regrouping for your first wildlife viewing session. This is one of those places that is truly wild. You’re not allowed to just wander off on your own here, you must be with one of the staff who will keep you safe at all times. Our hosts have a range of different viewing sites, and will choose one according to where the bears have been most active. Estuary sites are reached by boat, while river sites are reached by a wilderness track. The viewing blinds on the river have been constructed with the photographer in mind, and are optimal and comfortable places from which to communicate with the bears. There is nothing quite like seeing your first grizzly emerge from the forest. 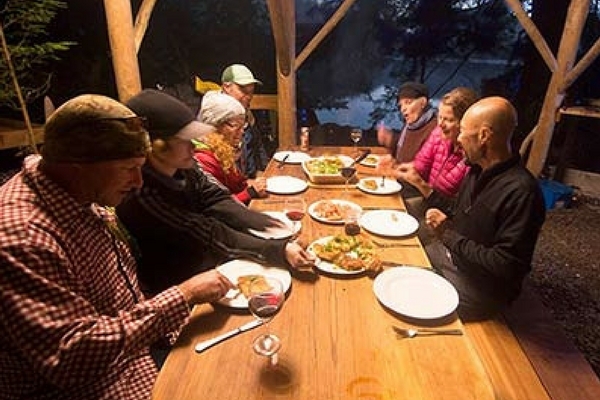 Returning to the lodge that evening, you will be treated to a wilderness-gourmet meal. Our biologist guide will present slides and videos, explaining the interaction of the grizzly bear with this unique ecology. ”I have travelled all over the world but this lodge stands out and I will remember it for ever. Put it on your bucket list. In the morning, you will be on the trail of the grizzly bear again after some good coffee and breakfast. A typical viewing session lasts three hours. After a morning of adventure, you will return to the lodge for lunch and a chance to relax. In the early afternoon we’ll go out on foot with our guide to enjoy an interpretive rainforest walk, examining bear signs and the general ecology of the area. In mid-afternoon you’ll venture out to see the bears again before relaxing in the lodge for dinner. On clear nights, the stars are amazing. ”Our expectations were far exceeded, this is as much an emotional experience as well as a physical one. 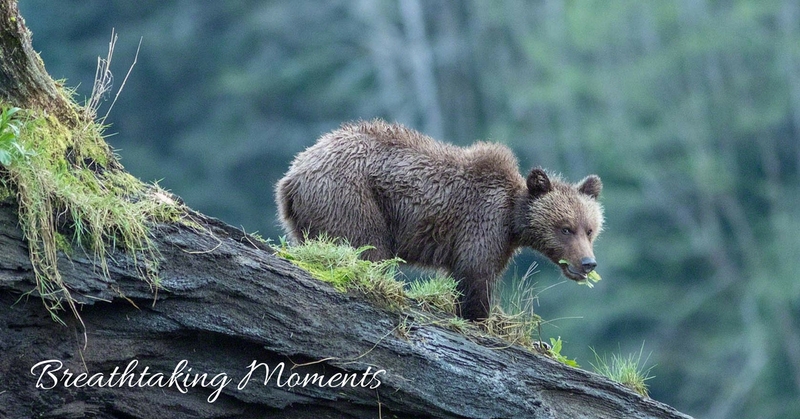 Being in the Great Bear Rainforest with the bears is something special that will stay in our memories for ever. Our highlight, was our "walk with a bear", moving downstream on the boat with the bear as he patrolled the waters edge looking for salmon, for a brief few minutes two worlds as one. Those few minutes will last a life time. Today is another wonderful opportunity to observe and communicate with grizzly bears on foot and open to the elements. Being in the wilderness on the same ground as them just across an expanse of river water is a breathtaking honour. After a morning of magical moments, you’ll return to the lodge for lunch and a chance to make notes in your journal, perhaps even practice your hibernation skills. In the early afternoon we’ll decide whether to go out on foot with our guide, have personal contemplation time, or take part in a group meditation. In mid-afternoon you’ll venture out to see the bears again before relaxing in the lodge for dinner and your last evening in this mesmerising part of the world. ”We often had bears within 10 metres of our open deck or had them walking past the elevated hide. The scenery is incredible, remote and pristine - the experience is unforgettable - Great Bear Rainforest has our highest recommendation! We’ve been advised to allow an overnight in Port Hardy because it’s highly possible to miss the connecting domestic flight due to weather conditions. But who would want to race off anyway after such an amazing wilderness immersion. Enjoy one more night together in our First Nations hotel recounting amazing communications, touching moments and awe inspiring experiences. After enjoying a delicious buffet breakfast, we’ll take our memories and a mid-morning flight from Port Hardy arriving back at Vancouver domestic airport at approx. 12.45pm. It will be hard to say goodbye to the new friends we’ve made but this is where this journey ends with big smiles and hugs before continuing on home with so much to share. From here you can connect with your International flight or return into Vancouver city for a few more days exploring before you head home. Please allow 2 hours to transfer to the International airport. If you prefer to stay on Vancouver Island a few more days, please advise at the time of booking and I can delay the return (subject to fare availability this may incur a price change). Please note: This schedule is subject to flow and fluidity at any time due to weather and other factors beyond our control. Important: There is no formal teaching on this retreat. Please make sure you attend an animal communication workshop or complete an online course beforehand in order to understand the necessary basics. 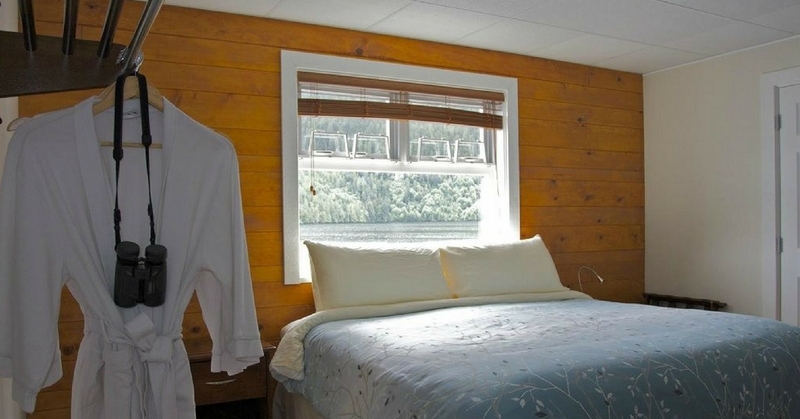 Step back in time by lodging in one of the many historic cabins of Telegraph Cove on Vancouver Island. These unique cabins have often been referred to by historians and by the descendants of the families that lived here many years ago. The buildings have kept their original charm from the past with the old “unimproved” look on the exterior and updated decor in the interior. Get back to nature with a genuine camping experience designed with your comfort in mind. In camp you’ll sleep in safari style tents with raised beds, duvet and blanket. Each beachfront tent sits on a raised deck easily accessed by its own hand-built driftwood stairs. These tents are a welcoming, cozy home away from home. 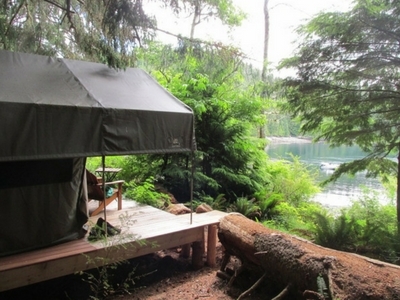 Your tent also has a covered vestibule with comfortable cedar chairs, and looks out across Blackney Pass. Roll back the door flaps and you don’t even have to get out of bed to see whales passing by! 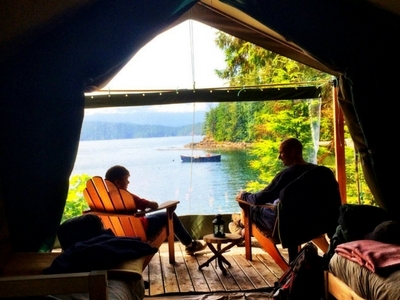 ”My tent was absolutely gorgeous. I will never forget the experience of lying in bed sipping my morning coffee and watching a pod of orcas pass by. Wildlife. Did we mention wildlife? There are 2 Queen tents, 3 Twin and 2 Single. All the beds are handcrafted with a pleasing combination of driftwood and locally milled red cedar. An Australian sheep’s wool duvet and woollen blanket keep you cozy all night long. Hot water bottles are also available from the kitchen for cooler nights. The camp-style toilets are sit down toilets much like you have at home, each set back from the tents for easy access. There is one toilet shared between two tents. Each tent has its own water basin for washing up. The natural ‘shower house’ provides a private changing area and on demand hot water. There’s even a claw foot bath tub overlooking the humpback feeding grounds because watching whales from a bath tub is a good thing to do. ”Mention should be made of the camp - the love and care that had gone into building it was clear. Sitting in our luxury tent, or lying on the double bed, watching humpbacks blowing in the bay and herons feeding was magical, doing the same while having a shower was the icing on the cake. 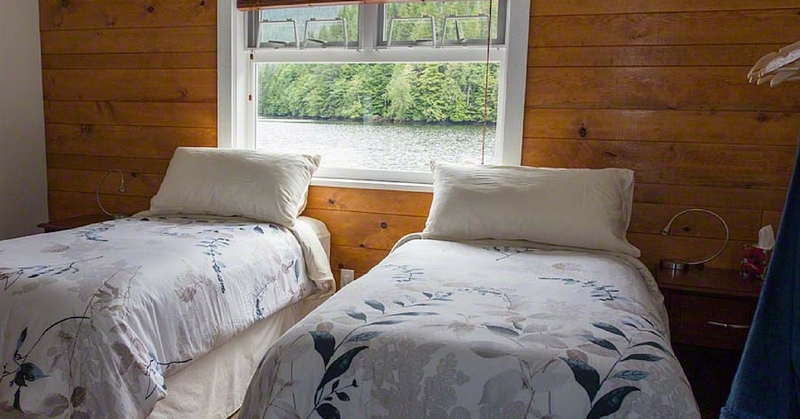 The charming floating lodge has eight bedrooms and a comfortable common area for you to relax and listen to natural history presentations from the wildlife biologists. Completely upgraded in 2014, each bedroom now has an ensuite bathroom with a shower. Natural wood decks surround the lodge, which is a perfect place to enjoy a glass of wine while watching otters or appreciating the beauty of the scenery. Another reason we love Great Bear Lodge is because of their commitment to low-impact ecotourism with use of wind and solar power. Kwa’lilas is a kwak’wala word used by Gwa’sala Nakwaxda’xw people meaning a place to sleep. A group of Elders chose this word in hopes that travellers and guests would find a peaceful rest after a day of exploration on the Northern Vancouver Island. 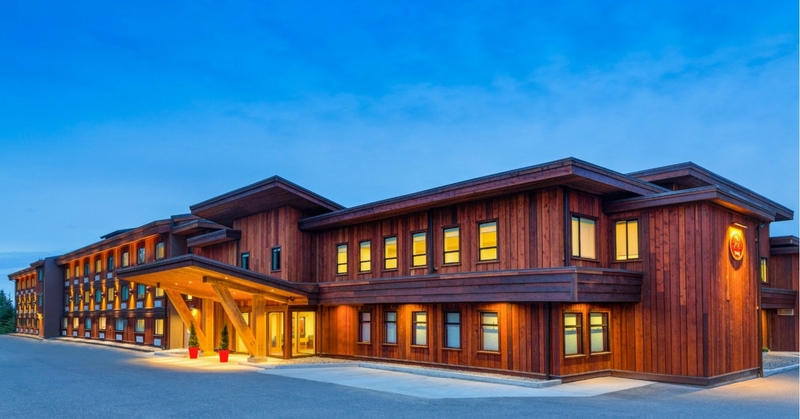 The Kwa’lilas Hotel was built by their very own k’awat’si construction company. The building makes extensive use of local cedar and the design is meant to resemble the traditional big house style with a smoke hole at the top of the building. Traditionally, when visitors see smoke coming from a big house, it means welcome. I am SO ready for Canada! Food is important and so is the outdoor dining experience. The camp has a fully equipped kitchen housed in an open sided driftwood and timber frame building, adjacent to an open air dining area built in a similar style. The centrepiece is the communal table, artfully crafted from a single slab of 400-year-old western red cedar. Wilderness-gourmet meals await you at the lodge on your return from the wilderness. 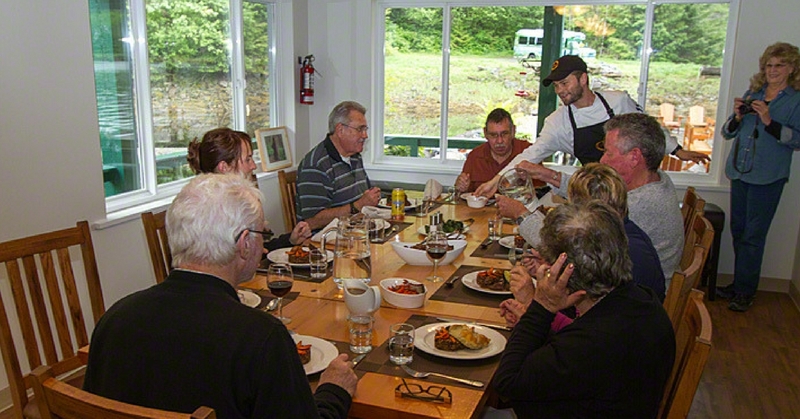 The lodge uses the freshest possible local ingredients, and all organic food when it is available. If you’re not vegetarian, one of your meals at the lodge could be freshly caught salmon roasted on a cedar plank. The lodge are happy to cater for vegetarians, as well as all dietary restriction and preferences with sufficient advance notice. Meals are served family-style at the large dining table, wine and beer is also included. Kayak: both singles and doubles are available. The boats are made by Seaward Kayaks, Current Designs, Boreal Designs and Necky. The guides are all certified by the sea kayak guides Alliance of BC with wilderness first aid training. Wilderness Bears: Heavy rain gear for serious downpours, binoculars (for those who don’t bring their own) and a warm insulated coverall (think onesie), if needed, including jacket, trousers, hat and rubber boots. Electricity is available at the eco-lodge to recharge batteries, but not for hairdryers! There is no electricity at the Orca camp. The Great Bear Lodge request you do not use perfumed toiletries, such as perfumes or colognes. The lodge provides shampoo, conditioner and body wash.
Orca Kayak and Great Bear staff gratuities of $30 per day (ensuring that you don’t need to worry about tips while at the camp and lodge). Orca Kayak and Great Bear Tours are included. Visa costs from your home if necessary: Electronic Travel Authorisation (eTA) to enter Canada, approx. $6/£4. Find out if you need a Visa/eTA here. Travel insurance or trip cancellation insurance prior to departure. Highly recommended. Canada Tax where not included. This tax is added to most consumer products, restaurant, and bar bills. 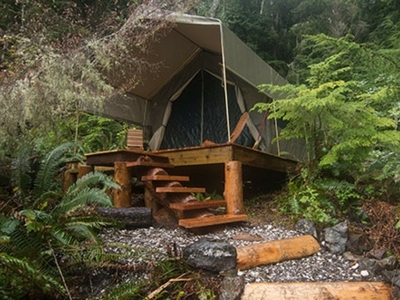 You will be pleased to know that there is no internet service offered at the Orca Camp or Great Bear Lodge, so you will be able to completely disconnect during your trip and immerse yourself in nature. 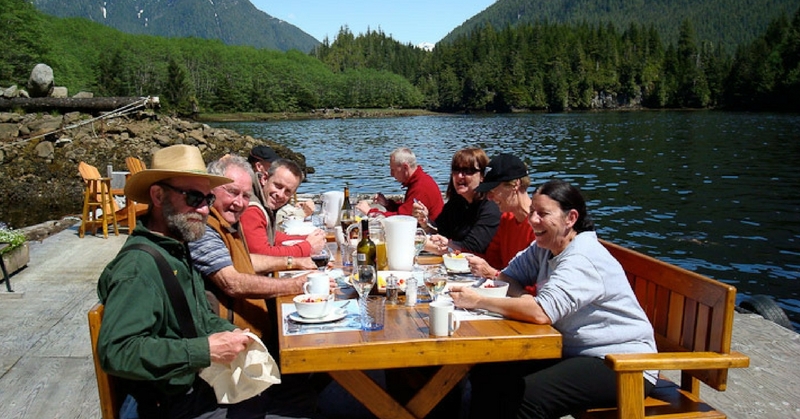 * Vancouver City supper, Telegraph Cove – breakfast, 2 x lunches & supper, Port Hardy supper. The Orca camp is situated within the traditional territory of the Mamalilikula-Qwe’Qwa’Sot’Em First Nation, on Compton Island on the edge of Blackney Pass, one of the most wildlife-rich marine ecosystems in the world. Blackney Pass connects Queen Charlotte Strait with Johnstone Strait where the strong currents churn up nutrients from deep below, feeding everything from small herring to the 40-ton humpback whales. Blackney Pass is also one of the best places in North America to view Orcas as they make their way to and from Johnstone Strait and the rubbing beaches of Robson Bight on Vancouver Island. The Great Bear Lodge is located in the Great Bear Rainforest. One of earth’s great wildlife areas, the Great Bear Rainforest still hosts healthy populations of all wildlife species present when Captain Vancouver sailed up the coast in 1793. Though roughly the size of Ireland, it has a human population of less than 17,000 outside of the town of Prince Rupert, compared to 4.5 million in Ireland. Virtually roadless, it is a land of island archipelagoes and long fjords that reach back into the glacier-capped Coastal Mountain range. The Coastal Mountain range has isolated many wildlife populations from their same species in the rest of North America. As a result the Great Bear Rainforest is home to many subspecies and genetically unique populations like, for example, the Spirit Bear or the coastal grey wolves. 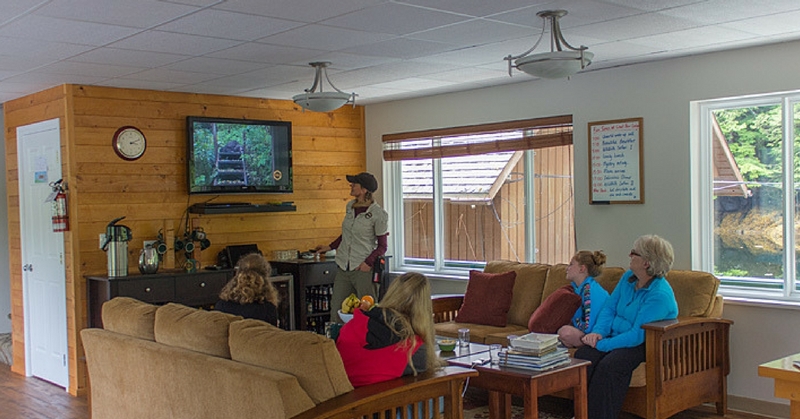 Great Bear Lodge is a founding member of the Commercial Bear Viewing Association of BC, which was formed to promote sustainable bear viewing on the coast. I don't want to miss out. Sign me up! There are four places for people to take part on the Bear part of the retreat, based on twin-share accommodation. Your itinerary will be a little more self sufficient at the beginning. Pea will meet you at the domestic airport in Port Hardy on 1 September along with the rest of the group. 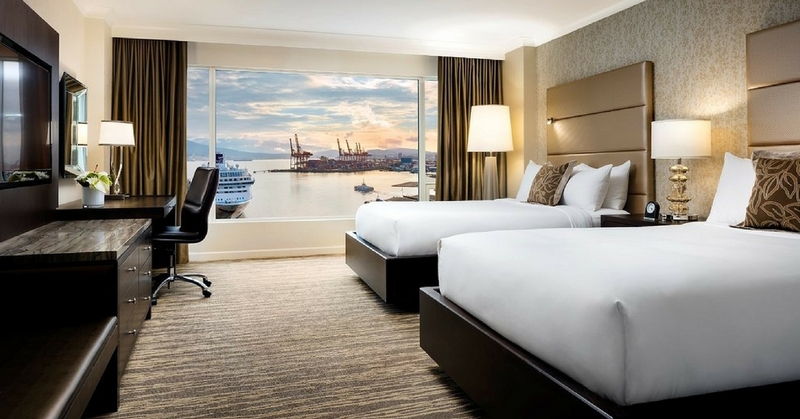 Arrive into Vancouver International airport, then transfer into the city to stay at your hotel. If you prefer, you could stay at an airport hotel (you must notify us at the time of booking). 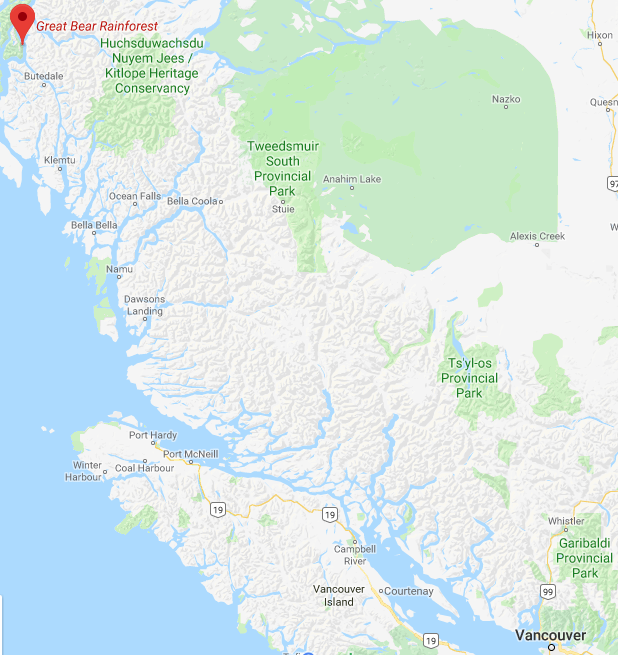 Arriving the night before means that in case of flight delays you’ll be able to make the domestic flight the next morning which is vital in order to rendezvous in Port Hardy. 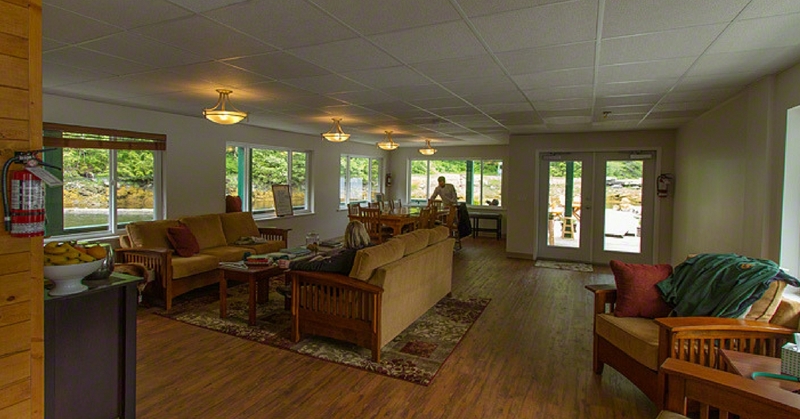 Transfer to the Vancouver Domestic airport for a flight arriving into Port Hardy no later than 2pm. Remain at this airport. You’ll be given an exact meet up location nearer the time. At 3pm you’ll meet up with the rest of the retreat group and our Grizzly Bear hosts. You are now on the main itinerary and will receive all of the inclusions as listed from this point on. From here we’ll take the Pacific Coastal seaplane over the Johnstone Strait to our remote wilderness camp and floating lodge. It is vital you are on this group flight. Latecomers can not be accommodated. Transfers into the city and back to the airport are not included. The SkyTrain is about $6/one journey. 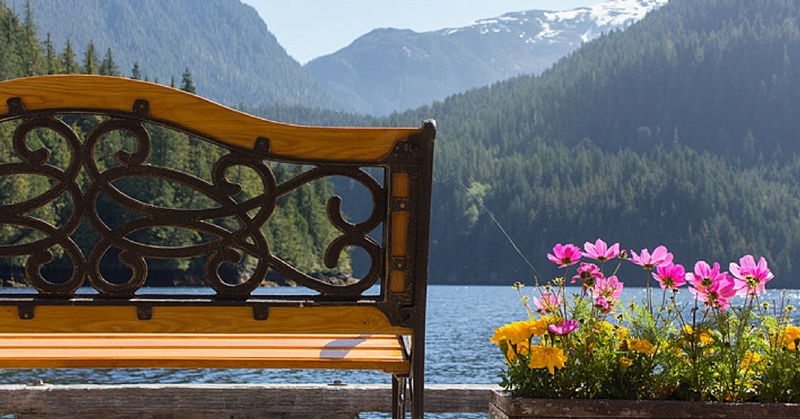 Your Vancouver city hotel and Port Hardy domestic flight are included. You may need to transfer to a nearby meeting point for the seaplane flight (at your own cost) but we hope to avoid this. Our Wilderness Bears hosts only inform us of the exact rendezvous nearer the time. Please note: The Orcas and Bears places (10 in total) will need to be full before the Bears Only places (4) are released. We’ll provide you with a suggested pre-retreat packing list to help you once you make your second payment securing your spot. There is no specialist equipment needed, this is provided by the Orca Kayka and Wilderness Bears hosts. Is there going to be an internet service? We believe an internet service will be available at most locations (subject to charge) except the Wilderness Bears. This is a wonderful opportunity to completely disconnect during your trip and immerse yourself in nature. If you or your relatives need to contact each other in case of an emergency there is a phone. Do I need to pack a load of wet weather clothing? You will need to bring a light rain jacket and also layers, layers, layers. When camping we advise you avoid cotton and go for microfibres which dry quickly. The Wilderness Bears tour provides heavy rain gear including trousers, boots and a hat, as well as a warm insulated suit, if needed. We will also provide a suggested pack list to you once your second payment secures your spot. What should I do if I want to share a room with a friend? When you confirm your spot on the retreat, there will be an option to enter the details of the person you wish to room share. If however you missed that, you can email your name and the person’s name you are looking to share with to pea@animalthoughts.com and we will look into this for you. Will all meals be provided for within the price of the retreat? 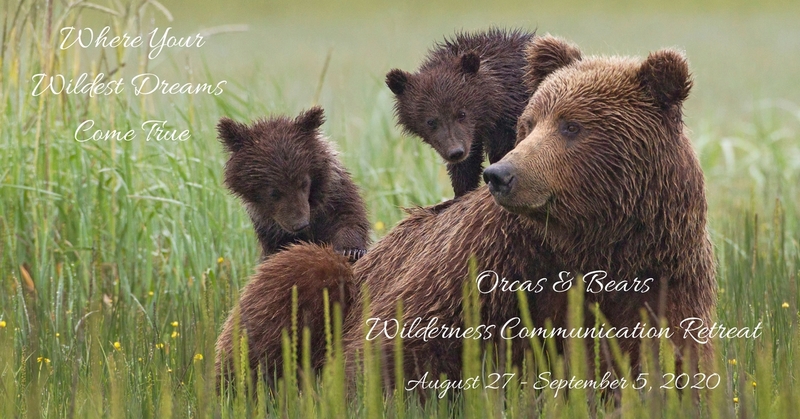 All meals will be provided on the Orca Kayak and Wilderness Bears part of the retreat. You will be responsible for most meals outside of this. Please look at the Included tab for details. I’m not vegetarian, can I request fish or meat? Our tour hosts provide the best gourmet wilderness meals and have been asked to provide a vegetarian option at every meal. While they do their utmost to cater for a number of alternative dietary needs (upon request) it may be advisable to bring a few provisions with you in case the food available is limiting. When you confirm your spot on the retreat, there will be an option to enter any special dietary requirements on the booking form. Should I arrange health insurance for this trip? You are responsible for arranging appropriate health insurance for this trip. It is also your responsibility to ensure that you obtain medical advice pertaining to your own personal situation, physical fitness and/or pre-existing medical condition(s). You are responsible for arranging appropriate travel insurance should your flights cancel or change. If you miss a domestic flight organised by us you will be responsible for the full cost of replacing the flight and any ongoing expenses in order to catch up with the tour. Missed tours and days will not be compensated and are at your own expense. No, your international flight and Vancouver City transfers will be arranged separately by you. Other flights, transfers, all accommodation, access to the retreat and most of the meals are included in the price. Please refer to the Included tab for full details. Is bear hunting still legal in BC? 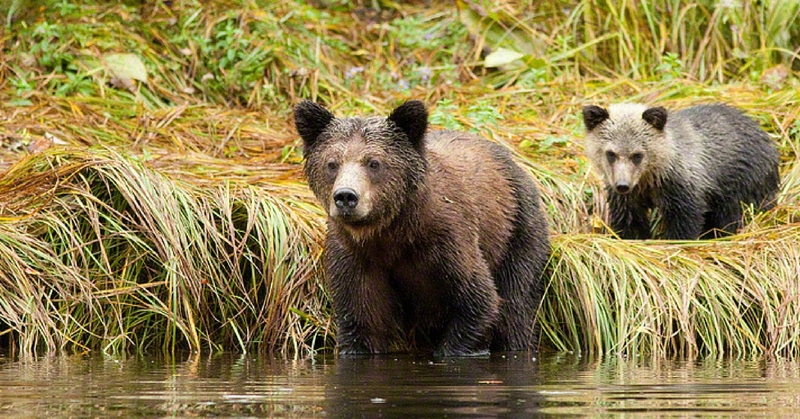 As of 2018, the British Columbia government banned all grizzly bear hunting in the province. Will we be on our own private retreat? It will depend on whether the numbers book so we can have an exclusive experience. However, the work is seasonal and the tour operators aim to fill all the spots. Life changing wild animal adventures in the wilderness don’t come cheap. A financial commitment will need to be made in order to enjoy this unique experience. If the places are not filled, the companies may decide to book a couple of tourists in the other spots. There are 10 places on the Orca Kayak and 14 places on Wilderness Grizzly Bears. I imagine this retreat, being so deeply transformational, will sell out fast. They hope, like us, we can enjoy our very own exclusive retreat experience. Our primary focus for the retreat is communication and the honour of being with wild animals in their natural habitat. You may also wish to take home some memorable moments on film. 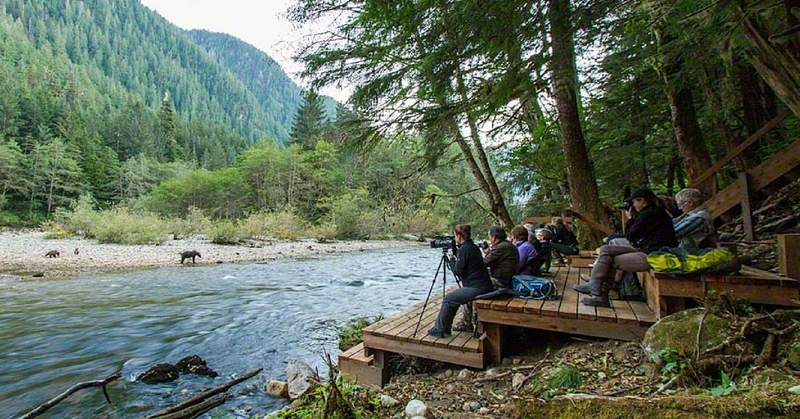 Each person has space on the bear viewing platforms to set up a tripod in front of them for photography. You’re advised to use a minimum 300mm in the 35mm format. Although, 500-600mm are better. If using digital cameras or video, zoom of 10X or greater will generally give you better photos. The typical viewing distance is 3-100 meters. Can you imagine being just 3 metres away from a Grizzly Bear? Flash photography is not advisable as it disturbs the bears. Please ensure that you know how to turn off the flash on your camera. Safety is paramount and our hosts have found the perfect way for us to view the bears without impacting on their natural behaviour. There are five viewing platforms built at the best fishing spots. 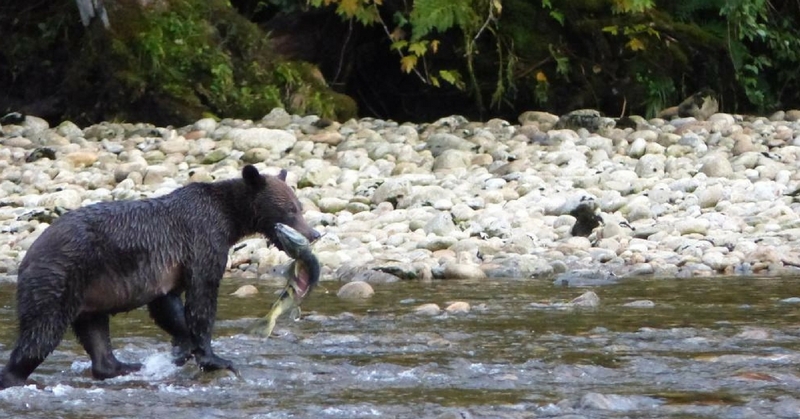 You can be literally sitting across the river from a mother bear and her cubs as they hunt for salmon. Some platforms are covered to keep you dry during rain, while others are open so that you can feel immersed in the rainforest. They are accessed from the lodge by school bus along a wilderness track. What are the benefits of Great Bear Lodge? It’s the only wildlife viewing opportunity in the river system providing a true wilderness experience. All tours are guided by a wildlife biologist. You can enjoy the adventure of a wilderness experience with a bit of pampering too: return to the lodge for hot showers, wilderness-gourmet meals and a cozy’s night’s sleep in a proper bed. There’s a maximum group size of 16 people. The spectacular intact ecosystem of the central coast of British Colombia is less than an hour flight from Port hardy. Why have you chosen to go with such an exclusive bear tour company? Quite frankly, I felt they’re the best. After lots of research, contact with various companies, reviewing their passion for bears, the impact our visit could make on the bears, the ethics and ecotourism, not to mention safety, I felt this company was the best fit. I also wanted to find an experience with bears that you just can’t get anywhere else. This company ticked all the boxes and so many more. How many hours kayaking per day? We usually do a trip after breakfast until lunch and another from lunch till dinner. We’ll probably want to get out in the boat at least once to be able to spend some more time with the whales. Why do you also use the boat once you’re at the camp? Do you need the boat to go out and reach the whales? Having the use of the boat means we are able to access a much larger area than we can by kayak. This means we can spend more time with whales and other wildlife. With a boat we can spend hours with them if we choose. Also, orcas, could be spending their time in Blackfish Sound, Weynton Pass, or on the Vancouver Island side or further away. Having a boat means we can expand our whale watching to all areas, not just the radius near our camp. It is also common that while kayaking the viewing of the orcas can be very distant. The late August time period is a very good time to be in the area as the quality and quantity of sighting can be very good. Why are we going during peak season? We’re getting the best of both worlds. We’ll be at the end of the largest gathering of orcas and at the beginning of the bear’s salmon season making these shy creatures easier to observe at the water’s edge. That’s why incorporating both these top predators into one retreat experience was a no-brainer! Especially when they are so close to one another in one of the most stunning and beautiful parts of the world. There are resident orcas but the time we’re going is very good for large orcas numbers which increases our chances of breath-taking encounters. This is also a brilliant time to be close to Humpback Whales and there will be a lot of sea lions and seals. There are also around 25,000 Pacific white-sided dolphins who travel in groups to deeper waters throughout the year. Bear wise, the salmon arrive in significant numbers in late August, with their run peaking in September and October. The salmon run also attracts a great number of bald eagles, gulls, ravens, and other fish eating birds. This is the best season for seeing cubs. This is one of those once-in-a-life experiences. No other animal communicator anywhere else in the world is offering an inclusive communication retreat where you can communicate with two of the world’s top predators; one of the ocean and one of the land. You will be taken through safety procedures and given a paddle lesson. You don’t need to know anything about kayaking before you come on this trip. Life jackets are available and there are double kayaks so you’ll be able to have a buddy paddling with you. In the event of an injury our hosts are capable of evacuation to the Port McNeil hospital using their speed boat. They can get to the hospital in about 45 minutes. In the event of something more serious there is a coast guard facility within 15 minutes of our camp. Regardless of where we are on the coast we will be limited on where we can go by weather, (mainly wind) and to a certain degree currents. 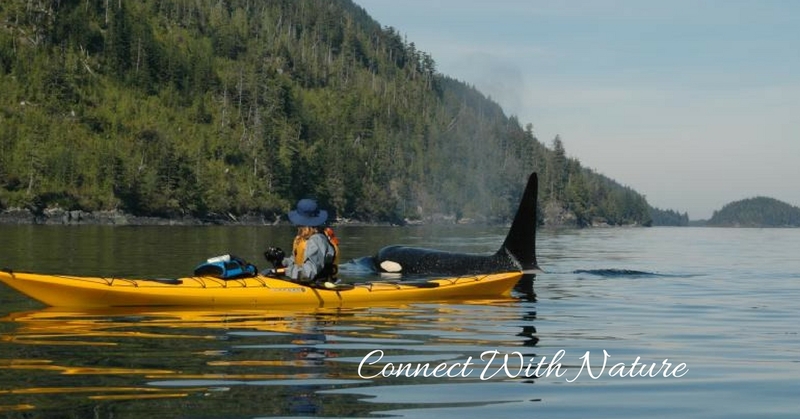 Any kayak group in the area will only be able to see orcas when they pass by the location where they are paddling whether it be Weynton, Johnstone Strait, Blackfish Sound or Blackney Pass. It is not feasible to be kayaking from our camp in Blackney and get to orca that are in Weynton Pass as this is about a 4-hour paddle away. We are however fortunate that if the weather is foul, we always have the option to paddle into the protected Broughton Archipelago. When the orca are far away we have the option to take out ‘Tenzing’, an ex-whaling boat in order to reach them. We are going to be based in true wilderness and bear country. There is no wandering off and you must pay close attention to the wildlife biologist and guides who are experienced in keeping guests safe. Wild animals have their own agenda and daily business and they can be anywhere at anytime. A bear or wolf may just be travelling through a location at the exact same time you’re walking to a viewing platform. Guests are escorted and as long as you listen to what you’re being asked you’re safety will be taken care of by the lodge staff. ”Remember, don't run if you see a bear - you'll be considered prey. Grizzly bears can run over 50km/h (much faster than Usain Bolt runs the 100m sprint). You can't out run them, so don't try. Join Pea Horsley for this 10 day / 9 night retreat of a lifetime. Pea is a celebrated animal communicator and author of Heart to Heart, Life Loss Love and Animal Communication Made Easy. Also a TEDx speaker, Pea leads spiritually conscious individuals on animal-focused retreats around the world. One of her greatest pleasures is witnessing how people’s lives transform through in-person, deep connections with wild animals in their natural habitat. A retreat with Pea is heart-opening, empowering, down to earth and fun. You will need to pay the single occupancy supplement when there is no other person of the same gender to twin share with you. You will be matched with the same gender. Male and female friends are able to opt for a twin share. Please let us know if you are a couple or family members who wish to share together. 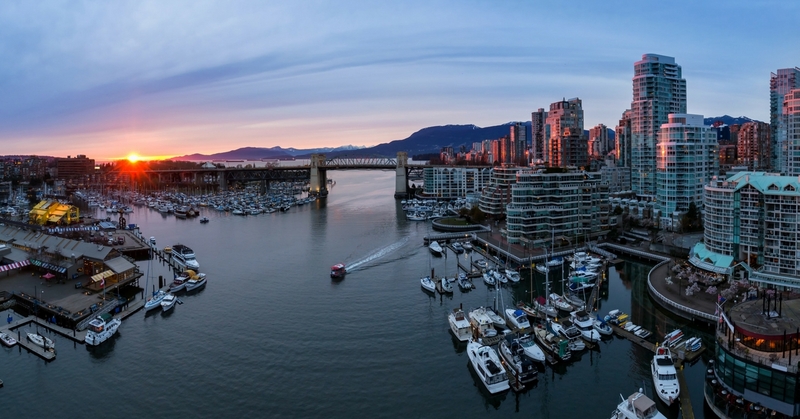 If you already reside in Vancouver City the investment fee can be adjusted to account for this on a case by case basis. ”Worth every penny and more! The bear trip was pricey for our budget but worth the price and more. Simply the finest vacation experience ever. Loved every minute.